Butler Veterans Advisory Board works with Butler Foundation to create a space honoring veterans. Butler Community College renovated one of its patios to honor veterans with funds received from a Butler Foundation grant. The Foundation gave nearly $125,000 to fund seven different projects. The patio, renamed “Veterans Square,” was chosen as one of those projects. The newly repainted, reroofed and refurnished patio is at Butler of El Dorado. Additionally, a veterans memorial plaque was attached to a limestone rock and placed in the flowerbed near the patio. Shortly after Independence Day, the Butler Veterans Advisory Board, along with T.J.’s Services of Benton and Larry Walty Roofing of Andover volunteered to improve this new space. 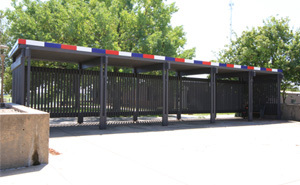 The formerly orange pergola was painted gray with red, white and blue trim going around the top. Though the project is mostly complete, finishing touches are still being made. The college is waiting to officially unveil Butler’s Veterans Square in November as part of the Veterans Day celebration.